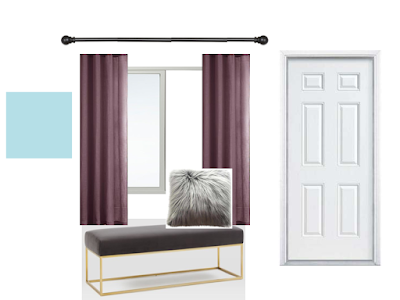 Today I am going to show you the concept design for the third wall in our Master Bedroom. It is located to the left of our last concept design post. This wall is a little tricky as it has a window, bathroom door and is located right next to our bed. It didn't leave much space. I originally didn't plan on putting anything in this area. I was only going to had curtains to the window. I have always liked the idea of having a bench at the end of our bed but our current set up does not have enough room. So I thought, "Why not put the bench under the window?" The wall is painted a light blue like the rest of the room. I thought the curtains would be a perfect way to add in some more deep purple. I chose a black curtain rod to match the rest of the hardware in the room. Underneath the window is where I added the bench. It's gray and matches our bedding well. I loved that the legs were gold to tie in with the rest of the gold accents in the room. I added a gray furry pillow on top to match the elegant feel of the bench. 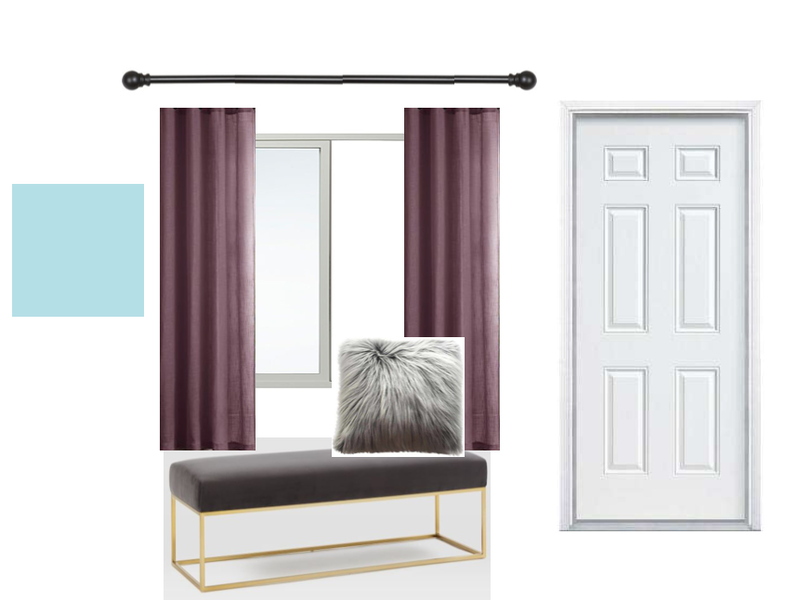 Even though the space was cramped due to the window and bathroom door I think it will match the overall feel of the rest of our bedroom.